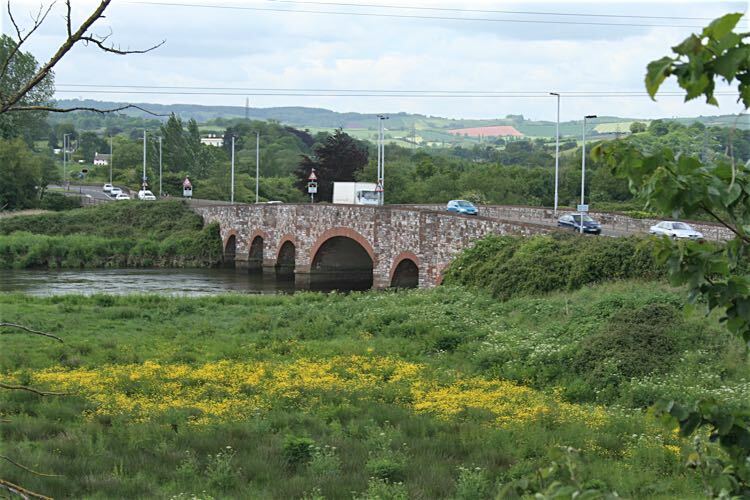 This bridge, to the south of the city, was the lowest crossing point of the River Exe before the completion of the M5 motorway. 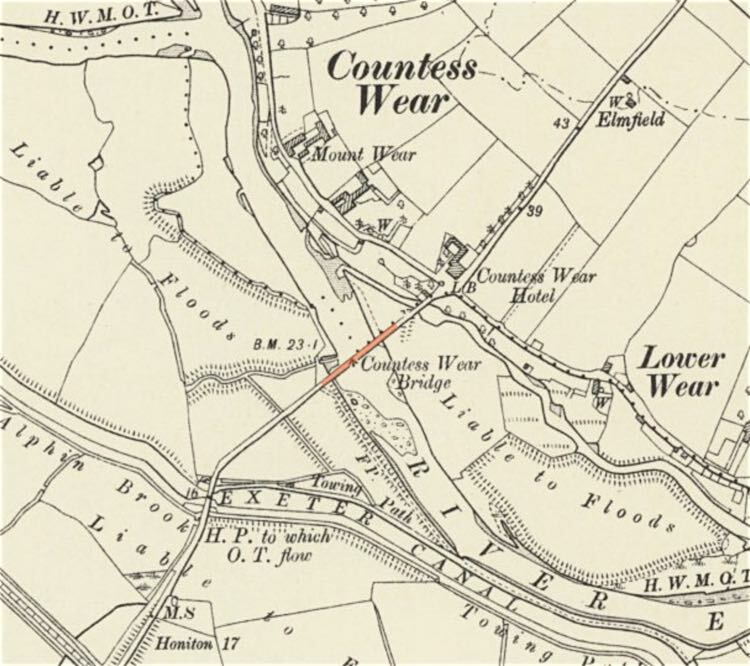 Before the bridge was built it was a dangerous fording point - after three men and a horse were drowned, the Exeter Turnpike Trust decided to build a bridge. 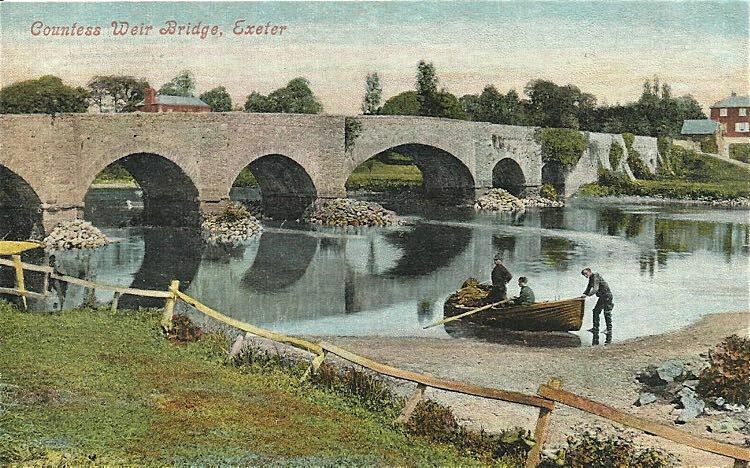 This was a busy time for the trust, as they had just embarked on building a new stone bridge up river, at Exeter in 1770. 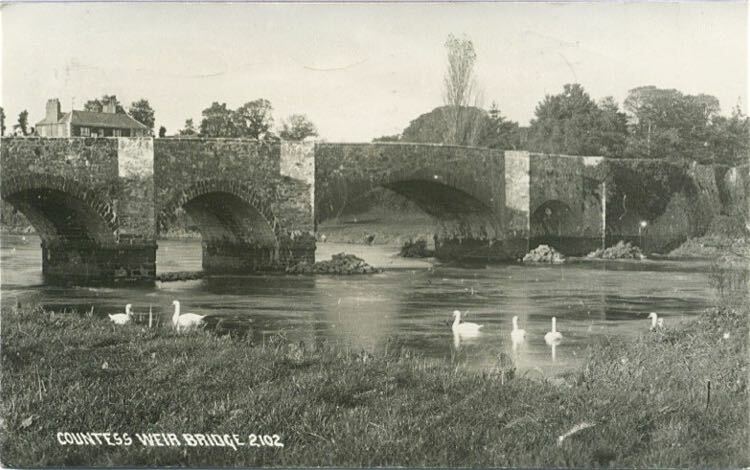 Thomas Parker of Topsham was engaged to build the Countess Wear bridge to a conventional stone design. Work started in March 1771 and it was opened on 14 September 1774. It had seven spans of between 23ft and 26ft in length. The width was 13ft 7in. 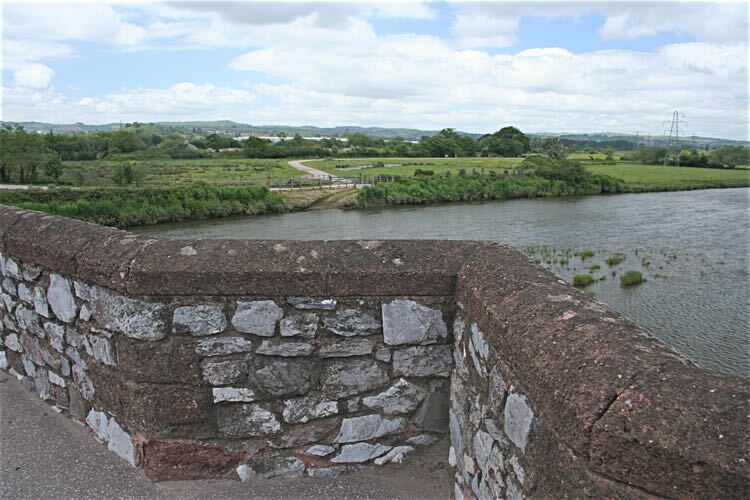 The weir after which the bridge was named was built by Isabella de Fortibus in 1284, cutting the port of Exeter from the sea, is just above the bridge. 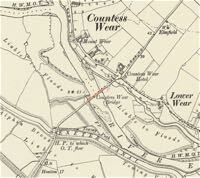 Also, the first Exeter Canal built by John Trew joined the Exe just below the weir at Matford Brook. In 1842, the two central arches were replaced by a 60ft arch by Thomas Whitaker, despite William Spicer, a creditor of the Countess Wear Bridge Toll, publishing an advert warning that the modification was a 'dangerouse experiment'. The widened arch was built for Robert Davy who had a part ownership in the nearby paper mills. Davy transported coal to the Countess Wear paper mill, and limestone to the kilns in the village. The cost of the modification was shared by Davy and the Turnpike Trust. In 1938 the road was widened to 45ft to cater for increased motor traffic along the new Exeter bypass. They used reinforced concrete with masonry facings - this is the side shown on the photo above. The opening of the M5 relieved the bridge of many of its 60,000 vehicles it was carrying per day. It is now part of the A379. The northern or upstream side is unmodified and still retains the facing of Parker's original bridge. In 2014, Listed Building Consent was granted for a major upgrade of the A379, which would also include the bascule and swing bridges over the canal. A cycle and pedestrain bridge was constructed, with concrete piled foundations in the piers of the south side of the stone parapet. It has been designed to appear to defy gravity, while, at the same time, to obscure as little of the original bridge as possible. Countess Wear Bridge was Grade II listed in 2004. The bridge from Glasshouse Lane. One of the niches to protect pedestrians from carts and animals crossing the bridge. The wider central span was added in 1842. A pre First World War colour tinted postcard.